Akbari, R., Vahidian Kamyad, A., Heydari, A., Heydari, A. (2016). The analysis of a disease-free equilibrium of Hepatitis B model. Sahand Communications in Mathematical Analysis, 03(2), 1-11. Reza Akbari; Ali Vahidian Kamyad; Ali akbar Heydari; Aghileh Heydari. "The analysis of a disease-free equilibrium of Hepatitis B model". Sahand Communications in Mathematical Analysis, 03, 2, 2016, 1-11. Akbari, R., Vahidian Kamyad, A., Heydari, A., Heydari, A. (2016). 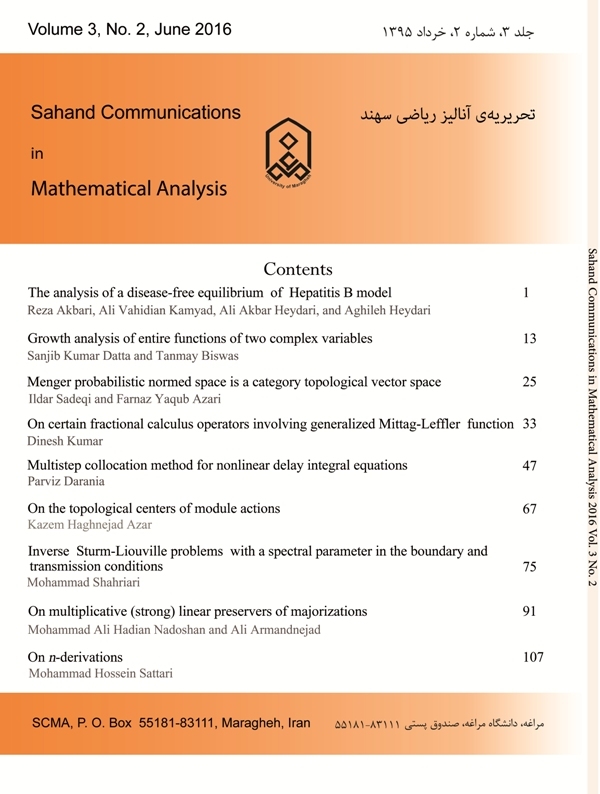 'The analysis of a disease-free equilibrium of Hepatitis B model', Sahand Communications in Mathematical Analysis, 03(2), pp. 1-11. Akbari, R., Vahidian Kamyad, A., Heydari, A., Heydari, A. The analysis of a disease-free equilibrium of Hepatitis B model. Sahand Communications in Mathematical Analysis, 2016; 03(2): 1-11. 1Department of Mathematical Sciences, Payame Noor University, P.O.Box 19395-3697, Tehran, Iran. 2Department of Mathematics Sciences, University of Ferdowsi, Mashhad, Iran. 3Research Center for Infection Control and Hand Hygiene, Mashhad University Of Medical Sciences, Mashhad, Iran. In this paper we study the dynamics of Hepatitis B virus (HBV) infection under administration of a vaccine and treatment, where the disease is transmitted directly from the parents to the offspring and also through contact with infective individuals. Stability of the disease-free steady state is investigated. The basic reproductive rate, $R_0$, is derived. The results show that the dynamics of the model is completely determined by the basic reproductive number $R_0$. If $R_0<1$, the disease-free equilibrium is globally stable and the disease always dies out and if $R_0>1$, the disease-free equilibrium is unstable and the disease is uniformly persistent. R.M. Anderson and R.M. May, Infectious Disease of Humans: Dynamics and Control, Oxford University Press, Oxford, 1991. S. Bhattacharyyaa and S. Ghosh, Optimal control of vertically transmitted disease, Computational and Mathematical Methods in Medicine. 11(4) (2010) 369-387. S. Bowong, J.J. Tewa, and J.C. Kamgang, Stability analysis of the transmission dynamics of tuberculosis models, World Journal of Modelling and Simulation. 7(2) (2011) 83-100. P.V.D. Driessche and J. Watmough, Reproduction numbers and subthreshold endemic equilibria for compartmental models of disease transmission, Math Biosci. 180 (2002) 29-48. Y. Enatsu, Y. Nakata, and Y. Muroya, Global stability of SIRS epidemic models with a class of nonlinear incidence rates and distributed delays, Published in Acta Mathematica Scientia, 32 (2012) 851-865. H. Hethcote, The mathematics of infectious diseases, SIAM Review, 42 (2000) 599-653. J.C. Kamgang and G. Sallet, Computation of threshold conditions for epidemio-logical models and global stability of the disease-free equilibrium (DFE), Mathematical Biosciences, 213 (2008) 1-12. A.V. Kamyad, R. Akbari, A.A. Heydari, and A. Heydari, Mathematical Modeling of Transmission Dynamics and Optimal Control of Vaccination and Treatment for Hepatitis B Virus, Computational and Mathematical Methods in Medicine. Volume 2014, Article ID 475451, 15 pages. T.K. Kar and S. Jana, A theoretical study on mathematical modelling of an infectious disease with application of optimal control, Bio Systems, 111(1) (2013) 3750. T.K. Kar and A. Batabyal, Stability analysis and optimal control of an SIR epidemic model with vaccination, Biosystems. 104 (2011) 127-135. X. Liu and L. Yang, Stability analysis of an SEIQV epidemic model with saturated incidence rate, Nonlinear Analysis: Real World Applications, 13 (2012) 2671-2679. J. Mann and M. Roberts, Modelling the epidemiology of hepatitis B in New Zealand, Journal of Theoretical Biology. 269 (2011) 266-272. G.F. Medley and N.A. Lindop, Hepatitis-B virus endemicity: heterogeneity, catastrophic dynamics and control, Nature Medicine, 7(5) (2001) 619-624. A.A. Momoh, M.O. Ibrahim, and B.A. Madu, Stability Analysis of an Infectious Disease Free Equilibrium of Hepatitis B Model, Research Journal of Applied Sciences, Engineering and Technology, 3(9) (2011) 905-909. J.S. Muldowney, Compound matrices and ordinary differential equations, Rocky Mountain J. Math. 20 (1990) 857-872. J. Pang, J.A. Cui, and X. Zhou, Dynamical behavior of a hepatitis B virus transmission model with vaccination, Journal of Theoretical Biology. 265 (2010) 572-578. S. Sun, Global Dynamics of a SEIR Model with a Varying Total Population Size and Vaccination, Int. Journal of Math. Analysis, 6(40) (2012) 1985-1995. C. Sun, Y. Lin, and S. Tang, Global stability for an special SEIR epidemic model with nonlinear incidence rates, Chaos, Solitons and Fractals, 33 (2007) 290-297. S. Thornley, C. Bullen, and M. Roberts, Hepatitis B in a high prevalence New Zealand population: A mathematical model applied to infection control policy, Journal of Theoretical Biology. 254 (2008) 599-603. P. Van Den Driessche and J. Watmough, Reproduction numbers and subthreshold endemic equilibrium for compartmental models of disease transmission, Mathe- matical Biosciences, 180 (2002) 29-48. K. Wanga, A. Fan, and A. Torres, Global properties of an improved hepatitis B virus model, Nonlinear Analysis: Real World Applications, 11 (2010) 3131-3138.
 WHO, Hepatitis B Fact Sheet No. 204, The World Health Organisation, Geneva, Switzerland, 2013, http://www.who.int/mediacentre/factsheets/fs204/en/. S. Zhang and Y. Zhou, The analysis and application of an HBV model, Applied Mathematical Modelling, 36 (2012) 1302-1312. S.J. Zhao, Z.Y. Xu, and Y. Lu, A mathematical model of hepatitis B virus transmission and its application for vaccination strategy in China, Int.J.Epidemiol. 29 (2000) 744-752. L. Zou, W. Zhang, and S. Ruan, Modeling the transmission dynamics and control of hepatitis B virus in China, Journal of Theoretical Biology, 262 (2010) 330-338.